Chocolate Pretzel Cake – Dark chocolate cake layers baked on a pretzel crust with chocolate chip cheesecake filling and chocolate frosting. Many of you may not know that in addition to making cakes and raising my two children, I also freelance in television research. What does that mean exactly? I basically travel around the country moderating focus groups about new or existing television shows. I’ve been doing it for over 13 years now, and aside from not getting much sleep while on the road, I still really enjoy it! Anyway, while traveling for a while back, I was thinking of new cake ideas, with the specific intention of coming up with something new to celebrate my wedding anniversary. Ryan and I both love my chocolate cake, so having that as the base of the cake was a no-brainer. I also wanted to do something completely new. I mean, we could eat my Chocolate Salted Caramel Cake, Chocolate Peanut Butter Cake, and the Tonight Show Cake over and over again, but I was in the mood for something new. As I sat on the plane early one morning thinking about what I could do for our anniversary cake, the idea for this one just hit me like a bolt of lightening. 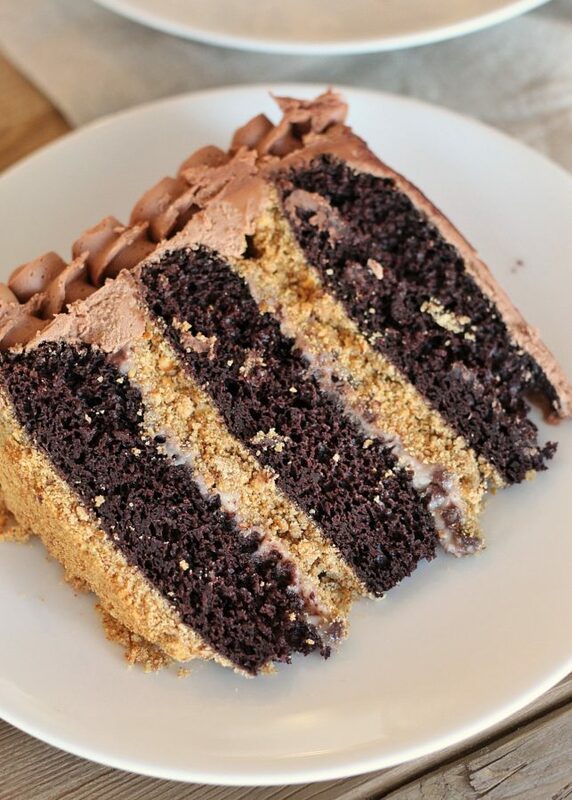 I’ve done a chocolate cake baked on a graham cracker crust and loved the crunchy texture it adds to the cake. So, to change things up a bit, I swapped out the graham crackers for pretzels and then added an adapted version of the Milk Bar Liquid Cheesecake for my chocolate chip cheesecake filling. I love this filling because it’s not as dense and rich as regular cheesecake. This cheesecake filling is creamy and smooth, and the tangy flavor pairs well with the sweet and salty combination already going on with the pretzels and chocolate. To top it all off, I used a light, silky chocolate buttercream, which you’ll find nearly impossible to not eat straight off a spoon. 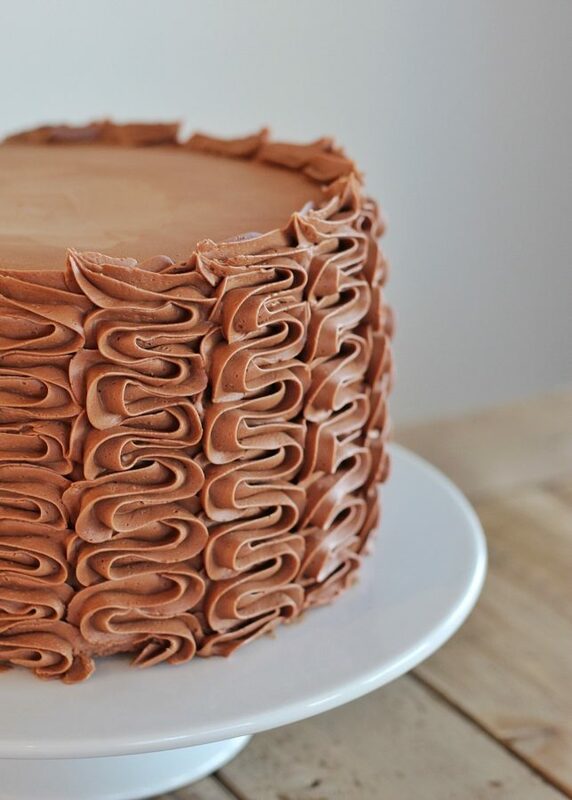 Look at those layers! 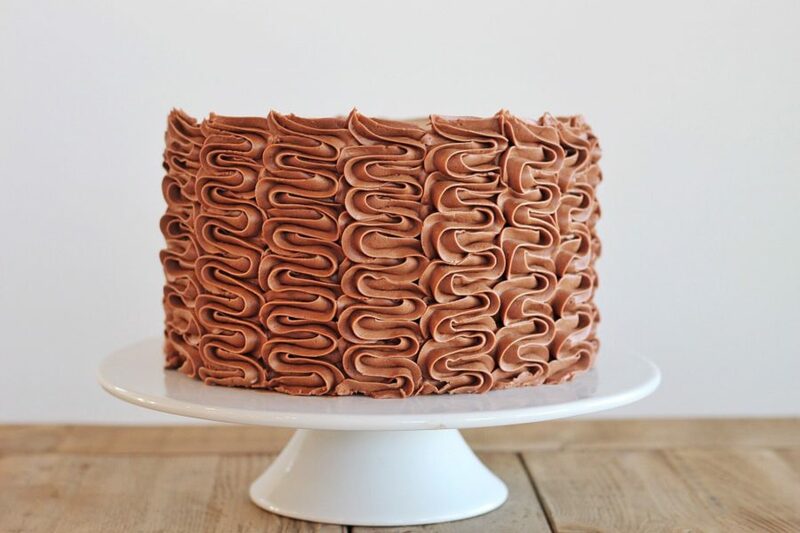 Make sure to take a bite with everything in it so you get the full experience of this cake. And one quick note – make the cheesecake filling the day before and keep it refrigerated in an air-tight container so it’s ready to spread but sturdy enough to hold up the cake layers. 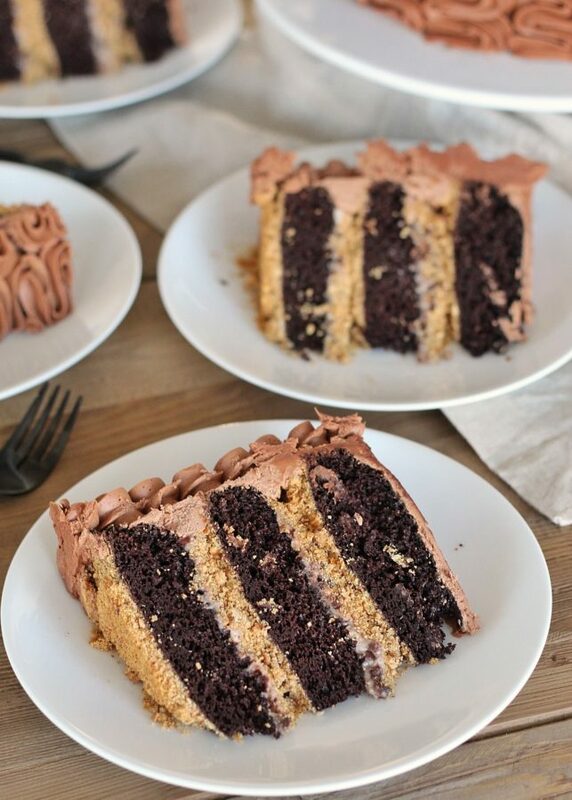 Dark chocolate cake layers baked on a pretzel crust with chocolate chip cheesecake filling and chocolate frosting. Preheat your oven to 375 degrees F. Spray three 8-inch round cake pans with non-stick spray and then line with parchment. Spray again. Set aside. In a medium sized bowl combine the pretzel crumbs, melted butter and brown sugar. Stir until all the pretzel crumbs are damped by the melted butter. Divide evenly between the three pans and press down firmly with your hand or the back of a spoon. Bake for 8-10 minutes, until golden brown. Let cool while you make the chocolate cake batter. Pour the batter into the prepared pans (about 15 ounces in each pan), over the cooked pretzel crusts and bake for 18-20 minutes, until a toothpick inserted in the center of the cake comes out with a few moist crumbs on it. Wrap in plastic wrap and chill in the freezer until ready to use. Do not chill in your refrigerator. The crust will get soggy. Preheat your oven to 300 degrees F. Line the bottom of a 6x6-inch baking pan with plastic wrap (I know, it sounds crazy but it won't melt). Set aside. In a stand mixer fitted with a paddle attachment mix the cream cheese on low speed for about 2 minutes. Scrape down the sides of the bowl with a spatula and add the sugar and mix for another 1 to 2 minutes, until the sugar has been completely incorporated. Stop the mixer and scrape down the sides of the bowl. In a small bowl, whisk the cornstarch and salt until combined. In a slow and steady stream, whisk in the milk and then the egg until the mixture is homogenous. With the stand mixer on medium-low speed, stream in the egg mixture. Mix for 3 to 4 minutes, until the mixture is loose. Scrape down the sides of the bowl and mix for another 30 seconds. Pour the cheesecake batter into the prepared pan and bake for 20 minutes. Gently shake the pan. The cheesecake should be firm and more set toward the rim of the baking pan but still a little loose in the dead center. If the cheesecake is still jiggly all over, give it another 5 minutes and 5 more if it needs it. If it begins to brown, take it out of the oven immediately. Let cool to room temperature and transfer to a medium sized bowl. Fold in the chocolate chips. Cover and refrigerate overnight. In a stand mixer fitted with the paddle attachment, beat the butter on medium speed for one minute. Slowly add the melted chocolate, while the mixer is on medium-low speed. Once all the chocolate is added, stop the mixer and scrape down the sides of the bowl. Turn the mixer on medium-low speed again and mix for another 30 seconds. Add the vanilla and salt and beat until combined. Slowly add the whipping cream and continue to beat for 2 more minutes, until light and fluffy. Using a wooden spoon, mix the frosting by hand, trying to push out any air bubbles. Level the chocolate cakes as needed. Spread a little frosting on a cake board and place the first cake layer, pretzel side down, on the cake board. Pipe a rim of frosting around the cake layer and fill with half of the chocolate chip cheesecake filling. Place the next cake layer, pretzel side down, on top of the filling and repeat step 2. Place the final cake layer, pretzel side down, on top of the second layer of filling and apply a thin crumb coat and refrigerate for 15 minutes. 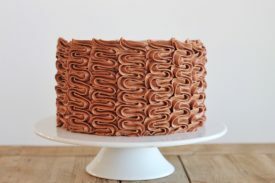 Continue frosting and decorating with the remaining chocolate buttercream. Best served right away or day of. If you're not serving day of, place the cake in an air-tight container and freeze it over night. Bring it to room temperature before serving. This looks and sounds amazing, thank you for sharing . How much would you charge for a cake like that? Hi Teresa! I’m actually not taking orders anymore. I’m so sorry! yes, the heat is so low it won’t melt. But you can spray your pan too if you’d rather not use the plastic wrap. I just noticed the filling still sticks to the sides without the plastic. Did you bake the pretzel crust by itself first? That should bake first on it’s own to create a crust and then you pour the batter on top of it and bake again. Just curious if pretzels become soggy by the next day. They do if you refrigerate the cake or leave it out. They stay crunch if you freeze the cake. This info should probably be in the recipe somewhere. Made this the other day and stuck it right in the fridge not knowing it would ruin the crust.